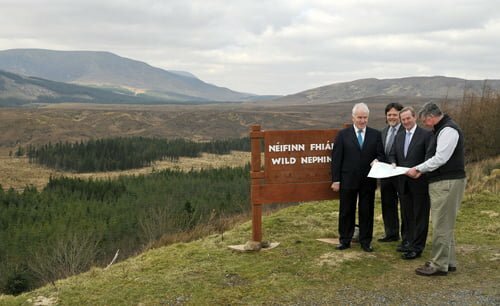 An area covering more than 11,000 hectares of the Nephin Beg range in North West Mayo has been designated as an official “Wilderness Area” following the signing of a Memorandum of Understanding (MoU) between Coillte (the Irish forestry service) and the Department of Arts, Heritage and the Gaeltacht. The document commits both parties to work together on the wilderness project, which includes forest lands and parts of the Ballycroy National Park. Described by the participants as “ambitious and innovative”, the project is the first of its kind in Western Europe, and will deliver a dedicated wilderness comprised of forest, mountain, bog, river and lakes in the Nephin Beg Range. It sees Coillte taking 4,400 hectares out of its commercial forestry operation and “re-wilding” the land, improving habitat and landscape quality over a 15 year period. The goal is a challenging one: landscape-scale conservation that preserves the integrity of a fully functioning ecosystem and promotes biodiversity while simultaneously providing the infrastructure and facilities that deliver an authentic “wilderness experience” for visitors who want to get closer to nature. Bill Murphy, Wild Nephin Project Manager said “This is an important day not only for Ireland but also for Europe as this agreement is a key step along the way towards the goal of setting aside 1,000,000 ha of wilderness in Europe by 2020. Ireland is in the forefront of looking at modified landscapes, the challenges of re-wilding and how these can contribute to wilderness in Europe”. To celebrate the unique designation and to advance the concept of wilderness in Europe Coillte and the Department of Arts, Heritage and the Gaeltacht are hosting a conference this week in Mayo on the theme “Wilderness in a Modified European Landscape”. The conference brings together more than 100 delegates and thought leaders from Europe, the US and Ireland to discuss the concepts of wilderness and re-wilding in Europe. It is important that people realise that “wilderness” is now created and managed; “wilderness” is farmed. However, it is also important not to do so much as to destroy the objective. There is a developing tendency in the name of “access” to reduce public lands to something resembling a city park. I’m thinking particularly of the deliberate damage at Castletown estate in Co. Kildare which is now defaced by footpaths and little bridges. I’m thinking too of cycleway plans for the Grand and Royal canals. Access for cyclists sounds fine but they turn out to be as wide as roads. (A 3.5m wide pathway!) Planners don’t seem to be aware that people seek out canal towpaths and other lands to avoid roads. We need wild places or somewhat wilder places. Frankly, I think we need to put public land into the care of gamekeepers rather than landscapers. Good luck to this project. As the project manager says: It’s important not only for Ireland but for Europe. Is the man on the photo and the Taoiseach mentioned in the article the same An Taoiseach Enda Kenny TD, who is willing to privatise Coillte ??? You are right wilderness cannot really be created or indeed managed – managing wilderness is a contradiction in terms. Managing wilderness is actually about managing the human interaction with the landscape – and that includes access for recreation. The wild nephin wilderness project has zoned the landscape from primitive through developed natural and while there will be some development in the developed natural zone, there will be negligible developemnt in the primitive zone. 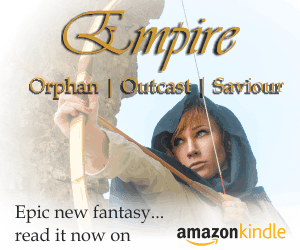 The ultimat aim is to close or remove roads and make the are truly wild. We want to create an area where man is a visitor who does not remain and where nature is driving the changes in the landscape. Wilderness is however a human construct – the decision by man to step as much as possible out of the picture – and therefore by setting lands aside for wild processes to drive the landscape we can “create” wilderness. Wilderness is not farmed its allowed to become a free willed landscape. We do not intend to create a forest park, public park but a wilderness which will allow futire generations to enjoy open spaces, challenging tough hikes, dark starry nights, wind, rain, midges and all that Praegar spoke about in this area (in 1937). Wild Nephin is a very exciting project and indeed a deeply welcome one. One of the important characteristics of wilderness is biological diversity. Ireland has some fragments of ancient native woods and share this characteristic unlike your average broadleaf wood but not yet at Nephin. I understand efforts are afoot to plant common species willow, birch and rowan in the area to add biodiversity. Will rarer upland natives be planted like aspen, bird cherry, juniper and yew? Although minor components of a native forest these species would set it apart as truly self sustaining natural area. I know a lot of the Nephin area is waterlogged highly acidic peat but there are richer flush areas that would have supported many species. It’s a fantastic idea, but it’s easy to predict that human impact will affect how this wilderness develops even without our being there. Forests won’t grow if the lands are left to deer; deer will thrive in the absence of predators; our choices of predator are either humans or wolves. The latter won’t happen, and the former surely contradicts the whole notion leaving this land to nature. Is there a map online that shows the area in question and the boundary of the wilderness area?